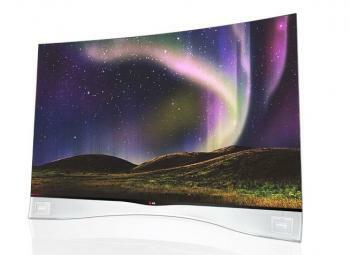 LG's EA9800 is a 55" curved OLED TV, featuring an Oxide-TFT WRGB Full-HD OLED panel (like LG's 55EM9700 OLED TV). The TV features "infinite" contrast ratio, passive 3D, Smart Touch Controls and a "paper-slim" design. It is made from Carbon Fiber-Reinforced Plastic (CFRP) and weighs just 17 Kg and is only 4.3 mm thick. The curved screen "removes any hint of visual distraction to maximize the viewing experience". LG's curved OLED TV is now shipping in the US (for around $3,000, now available on Amazon.com), in Germany (for €8,999) and in Korea for 10.9 million Won (about $9,800). In the UK it costs £4,999 (about $8,100).